Daniel Gabriel Fahrenheit (1686-1736) was a German physicist. He became known for the precise instruments he made. The degree Fahrenheit is named after him. He was the first to be able to determine the temperature with precision. His thermometers used Ethyl alcohol at first, but he later switched to using mercury. 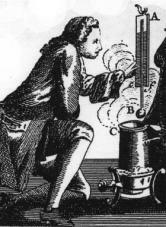 When he read an article by Guillaume Amontons about using mercury in barometers, he got the idea of using that substance for his thermometers. He calinbrated them to a temperature he could produce easily, -17.8 C.
In the year 1721 he discovered that water can be cooled below its freezing point without actually turning into ice.